I don't think evolution should be associated with our school. 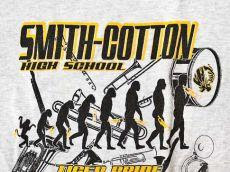 The Smith-Cotton High School band had a theme. Like most such exercises, it didn't seem to make much sense ... "how brass instruments have evolved in music from the 1960s to modern day." But okay ... they're teenagers and anything before last week is ancient history. It's hard to see in this jpeg file, which was the largest I could find (PZ has a better version), but each of the figures is carrying a brass instrument. Of course, the old "up from the monkeys" image is not really representative of evolution. But it has become associated with it and this use of it was harmless. Harmless, that is, except to the local ignorati. The band debuted the T-shirts when it marched in the Missouri State Fair parade. Summers said he was surprised when he received a direct complaint after the parade. While the shirts don't directly violate the district's dress code, Assistant Superintendent Brad Pollitt said complaints by parents made him take action. Pollitt said the district would now have to absorb the cost of the T-shirts — $700 — that would have been paid for by the band parents. Pollitt said an anonymous donor had originally planned to pay half the cost, but declined after the evolution image was placed on the shirts. However, the donor does plan to fund half the price of the new T-shirts. School District money spent on maintaining ignorance rather than on education. [T]he district is required by law to remain neutral where religion is concerned. If the shirts had said 'Brass Resurrections' and had a picture of Jesus on the cross, we would have done the same thing. It's not like we are saying God is bad. We aren't promoting evolution. I can see where the parents are coming from. Evolution has always been controversial. I liked the shirt because it was unique. The theory of evolution never even crossed my mind. This is an exciting time for the band. They don't need any negativity. These people are f*cking morons. I looked through the syllabus for Biology as it is taught at Smith-Cotton High School. Evolution does not appear anywhere in the list of topics. Also, it appears that Ms. Melby is a pre-school teacher. So, 1)Her ignorance in biology is a little excusable and 2)whatever she teaches about evolution will not likely be retained by her students. ...pre-school teacher...whatever she teaches about evolution will not likely be retained by her students. oh, man!! This not my experience with preschoolers!!! It's easy for non-creationists to assert that there's no incompatibility between accepting evolution and having faith in a transcendent Creator. But what are we supposed to say to people whose religion requires them to believe in bad science? ...what are we supposed to say to people whose religion requires them to believe in bad science? ..or, in the real world, learn to live with the separation of church and state, change states, change churches, or attempt to amend the constitution. The question is whether their religion requires them to be self-righteous dufuses. The T-shirt was harmless anyway you look at it and the reaction shows a disconnect to reality that goes far beyond science. Sheez! Talk about egocentric, narcissistic dingbats! Contrary to what many fundies seem to believe, things aren't always about them and their quaint (yet somehow often harmful and divisive) beliefs. This past year, Missouri apparently instituted new mandatory "End of Course" exams for Biology 1 as well as Math and English. According to the August 13th edition of STL Today, (the online version of the St Louis Post-Dispatch Newspaper) only 55% of Missouri high school students who took the exam in Biology received a passing score. It would be interesting to see the result for Smith-Cotton High School. From various posts here and there, it does seem that there are moderates in Sedalia and people interested in obtaining a high quality education for their children. Rather than using blogs simply to criticize, how can we be supportive of the forces of science and reason in this community and elsewhere? Many blogs (including this one, I hope) give information on how to counter creationist misinformation and to find reliable information on evolution. The other thing they can do is to let those who want good science education know that they are not as alone as it may seem in places like Sedalia and that not everyone thinks like their neighbors. It may not seem like much but they're only blogs.